WG participants: Anthony Arendt (NASA Goddard Space Flight Center, USA), Andreas Bauder (VAW, ETH-Zürich, Switzerland), Roger Braithwaite (Univ. of Manchester, UK), Regine Hock (Univ. of Alaska Fairbanks, USA), Peter Jansson (Stockholm Univ. Sweden), Georg Kaser (Univ.of Innsbruck, Austria), Marco Möller (RWTH Univ of Aachen, Germany), Lindsey Nicholson (Univ. of La Serena, Chile), Al Rasmussen (Univ. of Washington, USA), Michae Zemp (Univ. of Zürich, Switzerland). The glossary has been published 2011 by the International Hydrological Programme of the United Nations Educational, Scientific and Cultural Organization (UNESCO-IHP), Paris, in the series of IHP Technical Documents in Hydrology: IACS Contribution. Hard-copies can be obtained from the IHP Secretariat. The glossary can be downloaded from the UNESCOwebsite. The themes are sketched briefly below. In each case it is envisaged that a draft document will be circulated among glaciologists for public comment before preparation and release of a final document. Work has begun in earnest on the first theme, Terminology, while the others are projects for the near future. The Working Group intends to complete its activities in or before 2011. The Working Group is engaged on compiling a Glossary of Mass-balance Terms which will update and revise what has hitherto been the effective standard (Anonymous, 1969, Mass-balance terms, Journal of Glaciology, 8(52), 3-7). Although Anonymous (1969) has served glaciology well for nearly 40 years, there is widespread agreement on the need for a new look at the subject of mass-balance terminology. The new Glossary will reflect changes in practice with “conventional” measurement tools, and also in what is possible with the wide range of new tools which were not available in 1969. It will include commentary on usage, particularly problematic usage, with recommendations where appropriate. The purpose of this exercise is not to impose awkward constraints on the evolution of glaciological usage, but rather to promote clarity and reduce ambiguity in the communication of information about glacier mass balance. These goals are to be achieved by presenting definitions and commentary which represent a consensus among a representative collection of practising glaciologists. NSIDC, no date, Glossary. National Snow and Ice Data Center, Boulder, CO.
van Everdingen, R., ed., 2005, Multi-language glossary of permafrost and related ground-ice terms. National Snow and Ice Data Center/World Data Center for Glaciology, Boulder, CO. 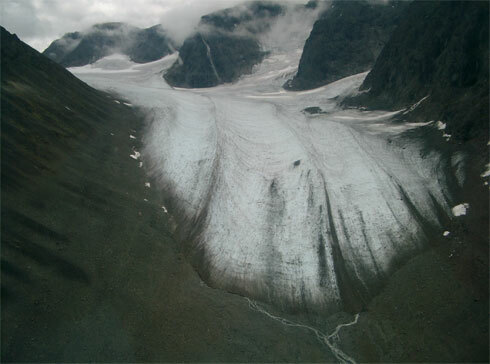 The technology for measurement of glacier mass balance is evolving rapidly, while making the best use of established methods continues to be a challenge. The Working Group hopes to develop materials on the state of measurement technology in all of its aspects, with special reference to the comparability of results obtained by different methods. Mass-balance measurements with error bars are more common now than formerly, but the assessment of uncertainty continues to be difficult. This is not a reason for avoiding the problems, and the Working Group hopes to offer at least a minimal set of recommendations on how to report uncertainty, perhaps based on a descriptive typology of measurement errors. Rabots glaciär, northern Sweden, in Aug. 2003. 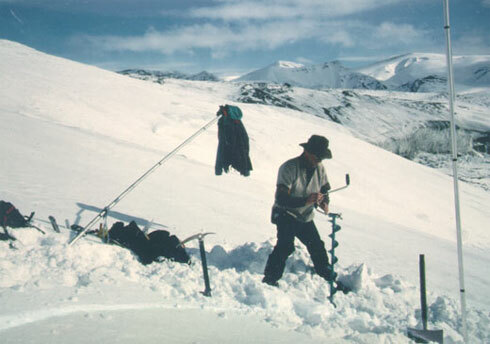 Many measurements of mass balance are built up from component measurements which are made at points on the glacier surface. Remotely-sensed estimates of mass balance, however, are growing in importance. Whatever the procedure, the goal is an estimate of a spatially-extended and sometimes of a temporally-extended quantity on the basis of incomplete sampling. Interpolation and extrapolation are therefore unavoidable parts of a mass-balance measurement programme. The Working Group will explore the possibility of standardizing procedures for these parts of the measurement process. In mass-balance work, homogenization or reanalysis is the retrospective alteration of long time series so as to reduce known or suspected errors and inadequacies. Perhaps most often, these shortcomings emerge from comparisons of different measurement methods of which one is believed to be more accurate than another. The Working Group will develop guidelines for the practice of homogenization, including for when and when not to attempt it and how best to ensure the preservation of all the meaningful information resulting from the whole measurement programme. In the changing contemporary world it is essential that the results of glaciological research and monitoring be widely available. It is also vital that these results should be as easy to analyze as possible, consistent with the complexity of the information. As one outcome of its work the Working Group envisages a set of recommendations to the World Glacier Monitoring Service about future formats for the reporting, archiving and publication of mass-balance data, and about mechanisms for ensuring their rapid dissemination.